I am thrilled to say, that I am now writing for one of my favourite websites 'Retro Collect'. If you are reading this blog then you probably already know about this great site, but if you've never heard of it then you really should head over there and have a look. It is your one stop for everything retro games and retro gaming. 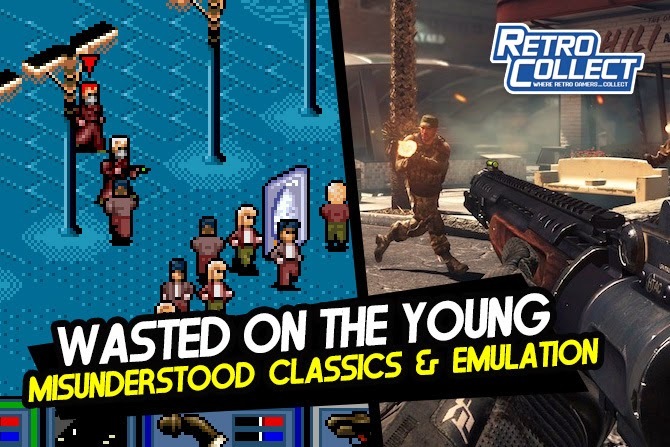 Featuring the latest classic gaming news around, informative reviews and an ever active forum, you'll feel right at home with other retro gamers. For me the greatest feature though is the Collection Data Base, which allows you to keep track of your collection. For my first post on there I am looking at how the youth of today approach old games, can they appreciate the merits of even the mediocre titles if they have been brought up on Call of Duty and their first console was an Xbox 360. "What the hell is 'loading' dude", I feel old watching them. "You know it's getting the guns ready and [similar]". At least the main game's look impresses; "it's in isometers, way good for old games". Sadly though the game play doesn't leave as good an impression: "I can move the radical onto these dip[twits] and shoot the [funsters]. You think I just kill them all? Yeah man just [funking] mow em down". You can read the full article here, and always feedback is appreciated. Hopefully I shall be writing for Retro Collect once a month, in between its business as usual here with weekly updates. But I shall always direct you to where you can find my writing - I'm modest like that! Hope you enjoy the post, and Retro Collect if that's new to you.